One of my absolute favorite Holidays in WoW. Share them below, and I will add yours to the post! Here is mine, just to kick this off. Happy Midsummer Fire Festival to all of you gorgeous bloggers and visitors, and a happy summer in the real world as well 🙂 Battle for Azeroth is soon upon us, and I hope you all are taking this time to enjoy a pause from fighting all the bad guys, until we are hard at work again. The past weekend, Blizzard had free-to-play for players who have been offline for a while. I had not played since February, so I thought: “Why not try?”. And here I am now and have resubscribed… Like probably many others… Suckers! At least I payed with in game gold! Swedish currency has been going down a bit so it is getting a bit more expensive (we are charged in Euro). Yesterday, when I was waiting for something (The World of Queueing) I decided to change my transmog I had for quite a long time, the Yellow Warlock. The weekend was midsummer, and I thought of something summerish, as in Sweden Midsummer is a big holiday, associated with flowers, and dancing and special food and (for some) drinking and … eum… fertility. But then realised it is the Warcraft Fire Festival. Since I am destruction specced something fiery would be nice. I have regularly used title “Flame Warden”. I just read Alunaria’s Time to get creative #3 – Show me your Midsummer Fire Festival transmog, so I took some screenies, and here it is. I joined the festivities with my minion. Honestly, I do not use succubus very often, but I was just out of a battleground. Honestly. Today I got a quest to travel to Silithus and I caught fire there! I did leave. I felt like I was intruding. And that’s the story! Believe it or not! 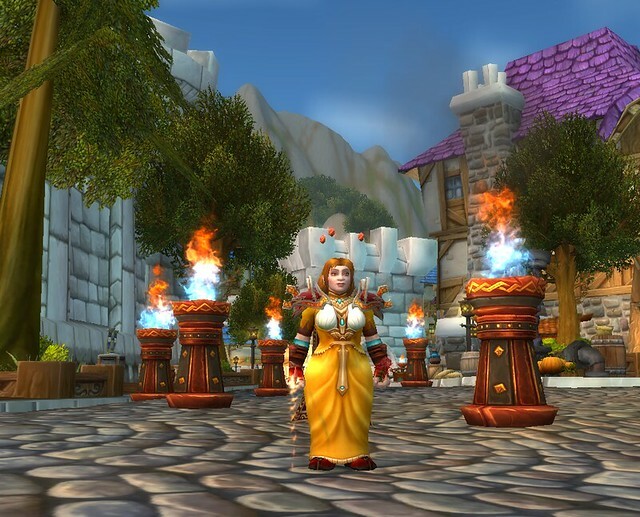 Alunaria of Alunaria’s Avenue has proposed a new transmogging challenge: transmogs for the Midsummer Fire Festival that also fit with your class. We’re always up for transmogging fun, so here’s our ideas. For my Tauren shaman, the Midsummer celebration is very important. It is a time to honor the spirits of the fire, which she does by dancing in her Flamedancer Regalia. So, for her, Midsummer is a time to get away from it all and go have her own private little fire way up in the snowy mountains where no one will bother her. She dresses appropriately for the climate in her Aurora-Seeker’s Garb. 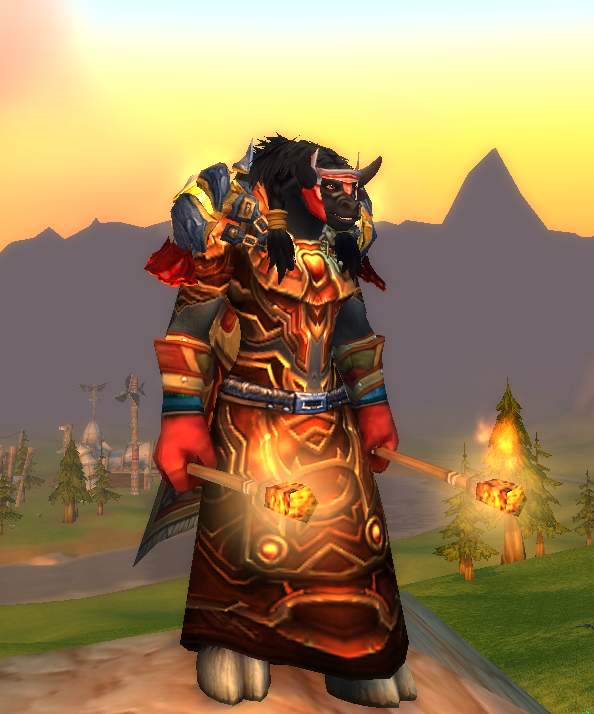 My fire mage’s hidden artifact appearance mog is already so gorgeous there isn’t really improving it, but I did change a few things to make it more Fire Festival-y. I was able to find a decently matching shirt, so it looks like the dress has sleeves (Elegant Robes plus Golden Filigreed Shirt). Otherwise, I pushed the accent colors (headpiece, boots, gloves, shoulders, cloak) more towards red and orange. Finally, I borrowed a red wand and a red flower (Flash Wand, Penelope’s Rose) from my arcane mage’s Love Is in the Air mog. Yes, I just need to make a post about this, even though the chance, that someone at Blizzard is ever going to see it or take it into consideration is small, but hey! Though I do stay away from story spoilers, I have been closely following the looks datamined on Leather in Battle for Azeroth. Especially after Legion, which contained NO Leather kilts at all, whatsoever (Right?). I need my Kilts. And if not, I need Chestpieces, that are Robes or Dresses. I will not be unfair! A few normal Chestpieces for the Rogues and Demon Hunters and what not is fine, it’s all good. But please. Give me a Kilt or two. A robe or two. Something new to wear with my antlers. It’s really all I have to say. It’s still early, I get it, BfA is months away, so let’s use our influence. At a time where there no longer will be any Class Specific Set Pieces, the fight for Leather Kilts and Robes AND Dresses is more important than ever! What a wonderful World of Warcraft that surrounds us daily. Do you ever stop to notice? Something as simple as the shadows, when you get close to a tree..? What is World of Warcraft’s most romantic place? To honor our latest expansion I wanted to find a place in Legion, that I thought would be perfect. It’s not hard to pick a gorgeous place in Legion. There are so many, I think. The attention to detail from the designer team has been nothing short of amazing. Those who know me well, can probably guess the zone, I would choose. Preferably a place with a little water too. A Wild Dreamrunner or two. If you put all of that together? I thought I had tomorrow to do this, but it turns out, the deadline is today. I am late, sorry. The quality must suffer, sadly. She would find one of her oldest kilts, which shows a little skin instead (with grace, naturally, in the most romantic way!). She would adorn herself with her favorite gems,, and as high a collar as she could find, that would also make her look somewhat gentle. She would find her most decorative jewelry chain, and she would top it all off with a few pieces to match her druidic soul. And this is how she would look. I hope your imagination can carry you the rest of the way, with the story I had in mind, but bedtime has caught up with me, so off I go. …That just made you want to level a new character, only to be able to wear that item? It has not happened to me in many years, but this chestpiece sure does. I am such a fan of the high collar look in World of Warcraft. I really wish they would make a shirt with it. I submitted the suggestion many times in game. This chestpiece does not belong to a new set. Wowhead states, that it has been around since patch 1.11! I’m late to the party, or maybe I just never looted it before. It’s from the Overlord’s Plate set. Maybe this is what I need, to finally make a Character that can wear them, and devote the time to level it this time. Or perhaps use the boost that Battle for Azeroth comes with, once I buy it. I never played a Plate character in my whole WoW career. Shield wearing neither! Wishing you all a Wonderful Wednesday Evening! Here’s a a few treats from the Seacrew though!